For those occasions, I find it impractical to navigate to the settings page and change that manually -- even when done via some "shortcut" placed on a homescreen. Preferably, I want to be able to automate this via tasker, to e.g. automatically switch when entering/leaving the "bad coverage area" or when one of those apps is in foreground (both conditions are covered by tasker, just the "action" is missing). I checked thoroughly on our site here, on the google-play-store, and even did an extensive Google search -- but all that turned up was either a shortcut or a kernel patch for specific ROMs, both no-gos for me. With Xposed module and Gravity Box installed, the pull down status bar can be customised even on stock ROM (of course it has to be rooted). With these installed, one can swipe down with two fingers from top and just tap the last tile shown as "3G" in the image. Though this nearly misses the first requirement of using no more than one tap, technically it still does as you have swipe down and use one tap. 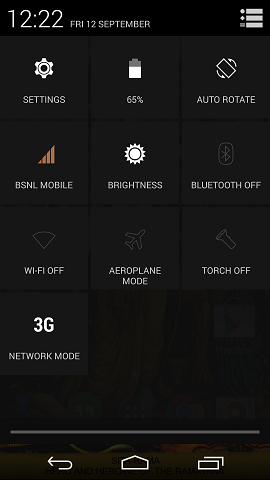 That tile toggles between 3G, 2G, 2G3G states. There is a minor lag to see the signal strength tile to reflect the status as "H+" or "E". By installing the Gravity Box, I was also able to bring in the additional tiles like "Torch On/Off", "Auto Rotate Lock" etc which were not available in the stock ROM. Update: Thanks to jsen who was kind enough to share an intent to switch between 2G and 3G using Tasker and Gravity Box (that implies Xposed framework and rooting). In my office, I have very bad 2G signal which drops my call very frequently. Hence I used to switch to 3G when I reach office. I created an entry task named "Enable 3G" and an exit task named "Enable 2G" which just sends intent as above. With Tasker's "Cell Near" state I can ask Tasker to enable 3G when I am near office and switch back to 2G while leaving. I've been looking for automated network switching for years, and I had always thought that this kind of behaviour was only possible using Cyanogen (or similar) ROMs. Anyway, I recently found some threads on XDA that suggest that this might not be true. All methods require rooting the phone, though, which I think is unavoidable. The hassle free and simple way is to install a launcher which lets you launch "tasks" like Holo Launcher. Just long press Desktop -> Shortcuts -> Activities -> Settings. Once under Settings you might have to dig in to grab the right one. It's a bit tricky but once done, you are all set. I haven't tried it on my new Android but works great on my older GB device. In Nova launcher you can add a widget -> Activities -> Phone services -> Network settings. Not the answer you're looking for? Browse other questions tagged settings data-connection 3g 2g or ask your own question. 2G versus 3G: Does it really save battery? Is it possible to disable 2g connections completely, while allowing 3/4g connections to continue? How to change “Preferred Network Mode” using adb without reboot? Can anyone reccomend a 2g / 3g switching widget? What is “Android Night Mode”, what triggers it, and what are the consequences?